Much has been spoken about the new ASUS ZenFone Selfie smartphone and we were delighted when we received it for a review along with the flash accessory Zen flash. Now will the phone delight us? We decided to find out. The phone has a stunning 5.5-inch full HD 1920 X 1080 resolution which is sharp, bright and suitably detailed with excellent Viewing angles, sunlight legibility and color reproduction. The screen is protected by Corning Gorilla Glass 4 and packs a decent punch with the Qualcomm Snapdragon 615 SoC complemented by 3 GB of RAM. Other specifications include 4G compatibility on both SIMs, internal storage capacity of 32GB expandable up to 64GB, 3000mAh battery and also an hybrid-SIM slot which can double up for expandable storage. The phone runs on tried and tested software formula of ASUS using its Zen UI to optimize the Android lollipop experience. Coming back to the signature feature, the 13-megapixel front camera boasts of an f/2.2 aperture and 88-degree wide-angle field of view. The rear camera has a similar 13-megapixel sensor, with an f/2.0 aperture and the laser autofocus system seen in action on the AsusZenFone 2 Laser. Both cameras have 5P Largan lenses, Toshiba sensors, blue glass filters, and dual-tone LED flashes. The laser autofocus and macro focus capabilities ensure excellent indoor shots and close-ups with the front camera. The laser autofocus system is quick and accurate, ensuring good &properly focused shots most of the time. The front camera takes pictures that are sharp, detailed and vibrant, with accurate color reproduction and good low-light performance and the front flash is a huge benefit. If you need a stronger flash, attach the Zenflash- a Xenon flash dongle on the back of the phone…and voila go click, click, click!!!! We loved the different modes in the camera like the standard automatic mode, a detailed manual mode, HDR, panorama, smart remove, slow motion, GIF animation and time lapse but what we loved the most is the Selfie panorama option. The app has a nifty sliding self-timer, which is an extremely intuitive way to take self-timed shots. With this Asus device, snapping a #Selfie is as easy as drawing an S on the display. Prefer a different gesture? Create your own in just a few moments. 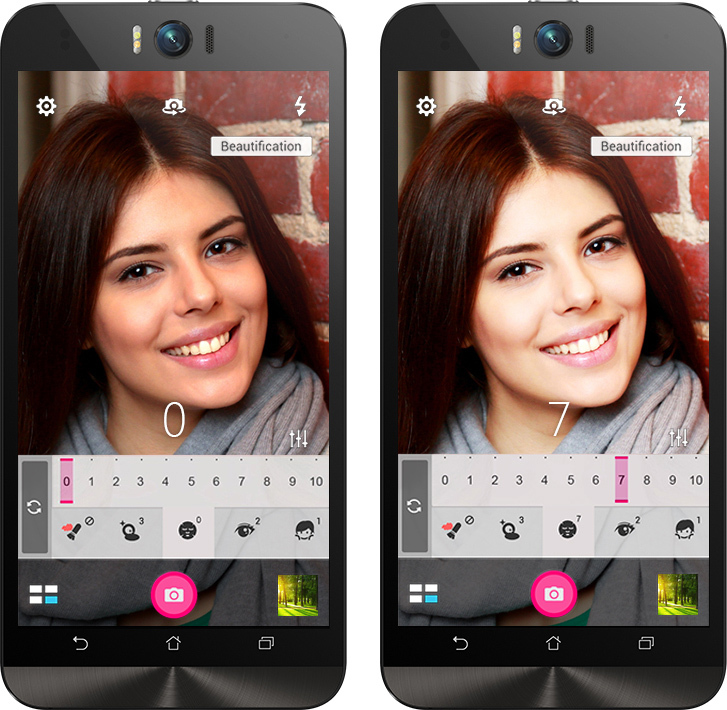 Make your Selfies look even more glamorous with the Beautification mode. This mode balances your facial features, softens your complexion and removes skin blemishes to give you flawless pictures in real time…..a perfect you!!! Enable the Selfie Panorama mode and snap panoramic selfies of up to 140 degrees. The special wide-angle mode, f/2.2 aperture front lens and 88-degree field of view enable the ZenFone Selfie to capture 140-degree panoramic selfies. We used the rear camera to capture clear close-up photos of mouth-watering dishes & everyday objects thanks to the camera's ability to macro focus down to 6 cm. We take our own Selfies everyday, so to try something different...we went in hunt of people who usually shy away from taking some....and believe us they loved their Selfies clicked by the ASUS Zenfone Selfie.